Cycling '74 creates software for artists, educators, and researchers working with audio, visual media, and physical computing. Our visual programming tools Max, MSP, Jitter, and Gen serve as the creative engines behind thousands of innovative projects. The Short Answer: Look, it's not a great name. Here's what I was thinking. 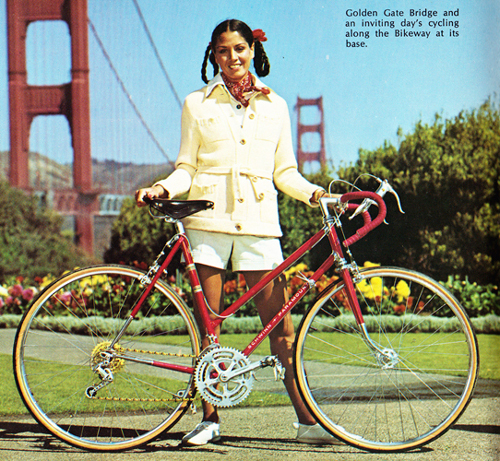 I've got all these nifty pictures of bike people from 1974. There's a cycle object in MSP. The choice seemed obvious. The domain name was available. All of us at Cycling '74 are learners and doers. We believe strongly in supporting others through education and access to our products. From teaching our users to get started with their first Max patch, to providing a solid platform for them to inspire others to innovate, we are serious about helping our users grow. Max grows in complexity at your own pace. Visual progamming tailored to your needs. We collaborate with musicians, researchers, developers, educators and artists to meet specific needs and solve unique problems. Part of what feeds our strength as a company is our ability to work remotely from all over the world. We have over 25 employees and consultants who come from various backgrounds and live in the most amazing places. Report issues with software, authorization, and/or the website using this short form. When there are openings, an article with details will be posted. If you email your resume and don't get a response, please know that we keep them all on file for future reference. Download Max 8 press images. Contact us to request current versions of our company logo.